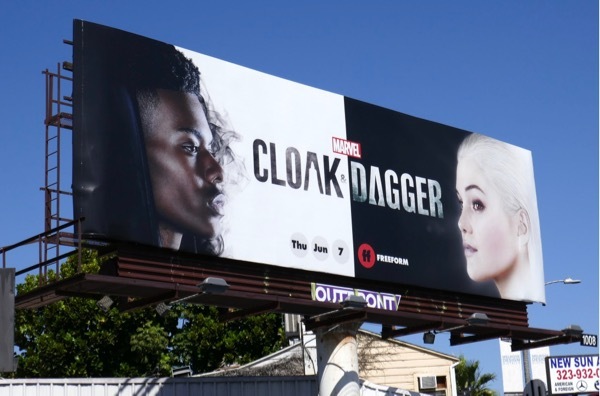 More comic book characters make the leap from printed page to small screen this month with the debut of Marvel's Cloak & Dagger on Freeform. The darkforce teleporting and light dagger-wielding codependent duo were created by Bill Mantlo and Ed Hannigan and first appeared in the pages of Peter Parker, the Spectacular Spider-man #64 in 1982, which spawned subsequent limited series and guest appearances in other Marvel books. Set in Louisiana this new moody teen drama explores their special symbiotic relationship in a different way than their comic book origins. 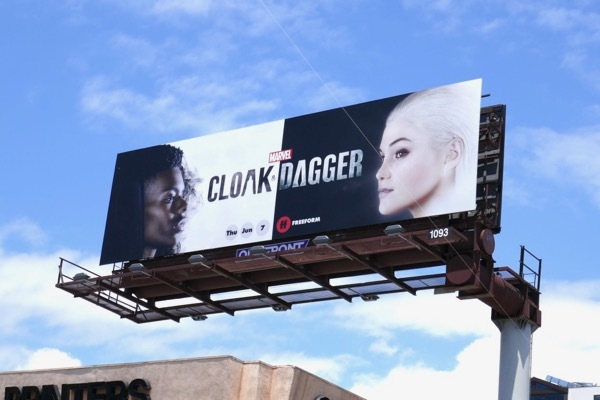 Aubrey Joseph plays 'Tyrone Johnson' who teleports cloaked in a dark smoke-like effect and Olivia Holt's 'Tandy Bowen' can create pure light daggers, which she can use offensively as weapons. 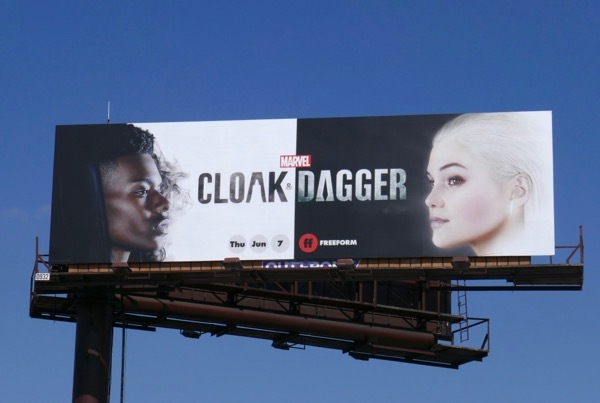 In the television adaptation their backgrounds are flipped, he comes from a wealthy family, whilst Tandy has always struggled to make ends meet, but they are connected by a mysterious childhood tragedy which gave them both superpowers. Together they find that they are stronger than when they are apart. 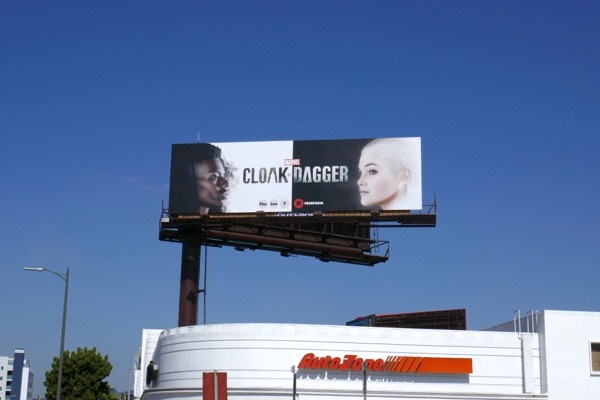 These series launch billboards for Cloak & Dagger were snapped along Pico Boulevard and Cahuenga Boulevard from May 17 to May 25, 2018. 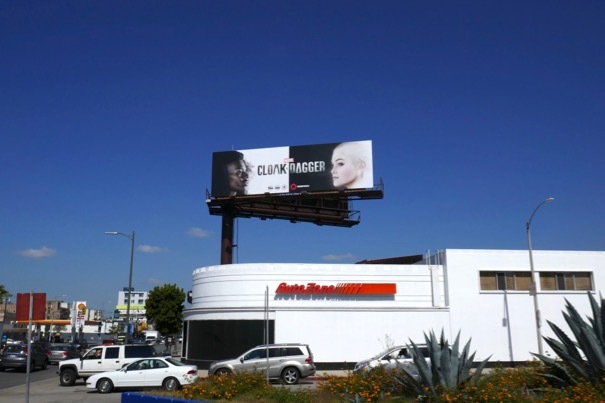 If you like this latest Marvel teen hero offering, then you may also enjoy these Runaways billboards. Here's hoping this grittier new take on the two beloved Marvel Comics characters lives up the sprit of the classic street heroes with a tragic past. 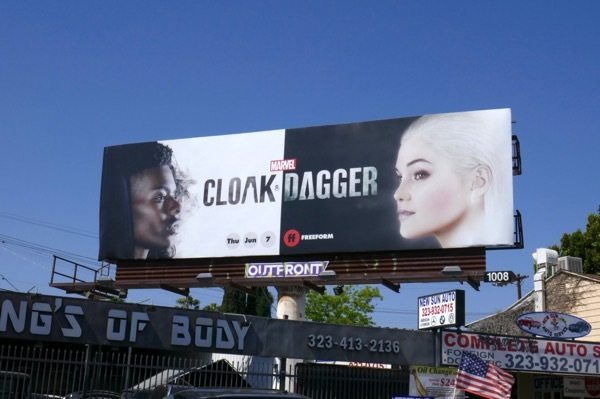 UPDATED: Here's another of the impactful series launch billboards for Marvel's Cloak & Dagger snapped along Melrose Avenue on June 8, 2018.